"The Annunciation Triptych" measures 25 3/8 x 46 3/8 in. (64.5 x 117.8 cm). The left panel pictures a woman kneeling before an open door, holding a long string of red prayer beads with a large silver bead at each end. 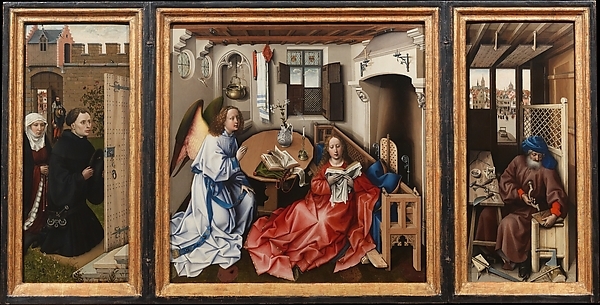 "Annunciation Triptych (Merode Altarpiece)." Robert Campin. The Cloisters Collection, 1956. New York: The Metropolitan Museum of Art. Overall (open): 25 3/8 x 46 3/8 in. (64.5 x 117.8 cm) Central panel: 25 1/4 x 24 7/8 in. (64.1 x 63.2 cm) each wing: 25 3/8 x 10 3/4 in. (64.5 x 27.3 cm). 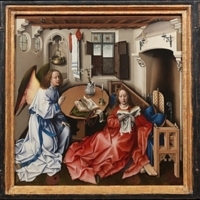 [Workshop of] Robert Campin, “Annunciation Triptych (Merode Altarpiece),” Medieval London, accessed April 22, 2019, http://medievallondon.ace.fordham.edu/items/show/27.